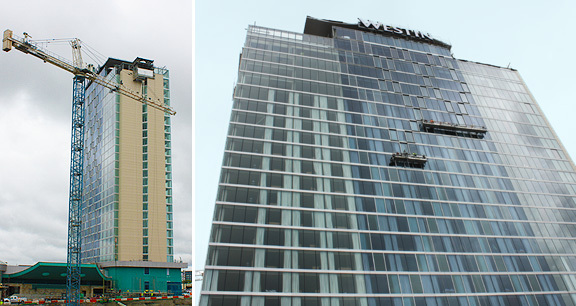 Project obstacles and solutions: In January 2015, ground was broken for the new Westin Hotel in downtown Nashville, Tennessee. The $120 million facility includes 454 rooms on 27 floors. The rooftop includes a spa, swimming pool and bar areas. The entire structure had to be completely constructed in 20 months, from groundbreaking to opening day. Southern Pan was selected as the general contractor for this project. REI performed all of the concrete work. In a very tight construction schedule, concrete that meets specifications is crucial. The set times on the concrete for each of the floors was very important on this job. Post-tensioned tendons were used to reinforce each of the floors. IMI had to supply concrete that would meet early strengths of 3,000 psi in 24 hours. This was required regardless of the ambient temperature. During the coldest months, IMI QC/QA used a high-range water reducer to meet these requirements. The other challenge when building a high-rise structure with post-tensioned concrete is making sure the mix will flow through the concrete boom pump. IMI QC/QA designed a concrete mix that used coarse aggregates that worked well with high angle pumping without compromising the strength requirements. Each floor was built with three concrete pours. The 28 day strength ranged from 7,000 - 8,000 psi. IMI supplied 30,000 yards of concrete for this project. The Westin opened its doors for business on October 13, 2016. For more information on achieving early strength in concrete, contact the sales representative for the concrete plant nearest your location. Click here.